The AutoSheeter has been designed to meet highly demanding applications where there is a need to quickly and accurately convert rolls of materials into sheets automatically. Based around Rotatrimâs highly regarded PowerTech PT Series of rotary trimmers, the AutoSheeter offers the ability to program the device with cut length and batch quantity required and the machine will then convert the media without any user intervention. 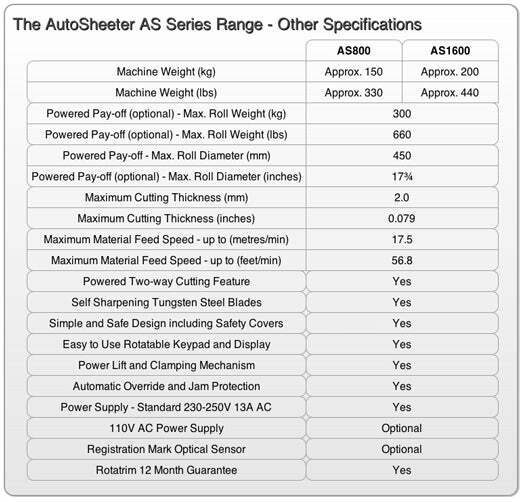 Available in both 800mm (31â) and 1,600mm (63â) versions, the AutoSheeter can convert almost any media, at any size from 25mm (1â) up to 1,600mm (63â), into virtually any length of cut. The AutoSheeter can be integrated into an existing production process or is available with a powered âpay-offâ to accurately feed the roll into the machine prior to conversion. As any roll of material becomes smaller in diameter and weighs less as the material is taken from the roll, the AutoSheeterâs microprocessor constantly adjusts the speed at which the material is fed into the machine, thereby ensuring a consistent cut length, each time every time. Two size variants available â 820mm (31 ") and 1,620mm (63 "). Will cut virtually any roll stock up to 2mm, including; Vinyl, Plastics, Digital Media, Paper, Film, Fabrics, Foils and even Tissue, etc. Heavy rolls of up to 300Kg can be accommodated using the optional Powered Pay-Off. Optional Powered Pay-Off is controlled by the AutoSheeter to ensure consistent media feed speed and registration to ensure accuracy. Optical Head of Form Sensor can be utilised to cut different sizes of sheet on the same roll automatically.